January 29, 1900 – Mayor Carter Harrison presents a proposal to the City Council concerning the removal of center pier bridges and other obstructions from the Chicago River. The mayor sets forth two goals in his proposal: (1) to rid the city of all of the old swing bridges and replace them with bascule bridges; and (2) to clear the river of impediments, such as the massive turntables on which the swing bridges are seated, so that the river will have a maximum flow toward the new Sanitary and Ship Canal, opened less than a month earlier. The mayor’s proposal states, “The trustees of the Sanitary District, with wise forethought, have kept all obstructions out of their canal. There is not a center pier defacing its surface or interfering with its free use or shipping from Robey Street to the controlling works at Lockport. The river, today a part of this channel, should be equally free of obstructions. Without its free and unobstructed use the day is not far distant when the requirements of the sanitary law of a minimum flow of water may not be had. Increased flow of water will be impossible while the center pier bridges, now obstructions in the main branch and that portion of the South Branch from Lake street to Robey street, remain. 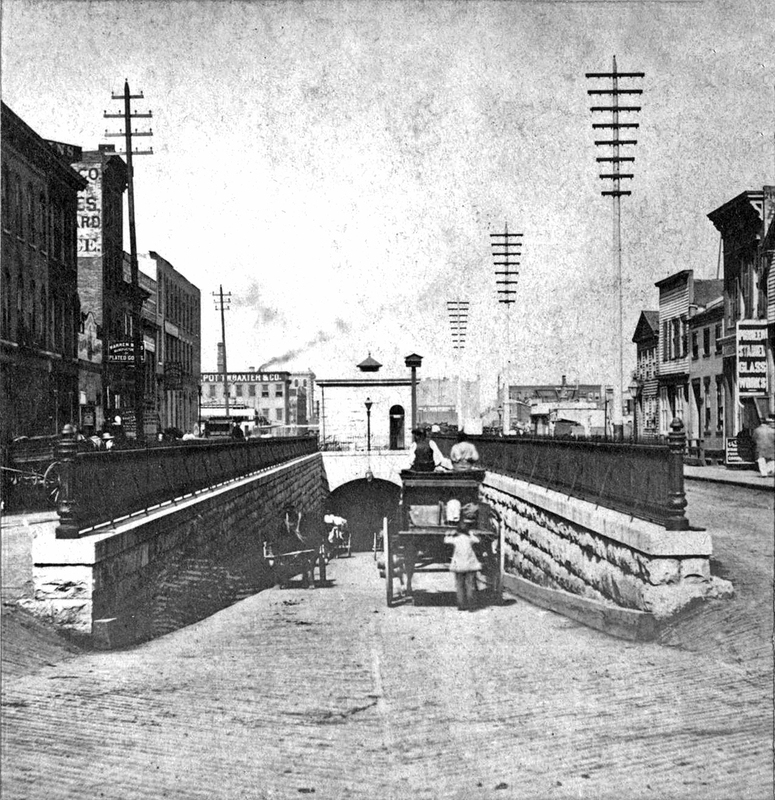 In short the existence of center pier bridges threaten the efficiency of the canal … I would recommend that either the special committee already referred to or the standing Committee on Harbors, Viaducts, and Bridges be instructed by your honorable body to request the Trustees of the Sanitary District immediately to take up the question of removing at their own expense, all center pier bridges now serving as obstructions in that portion of the Chicago River which may properly be regarded as a part of the drainage channel and substituting in their stead modern bridges of the bascule type.” [Chicago Daily Tribune, January 30, 1900] Two years later the city’s first trunnion bascule bridge would open at Cortland Street on the North Branch, and it would be followed in rapid succession by many more. 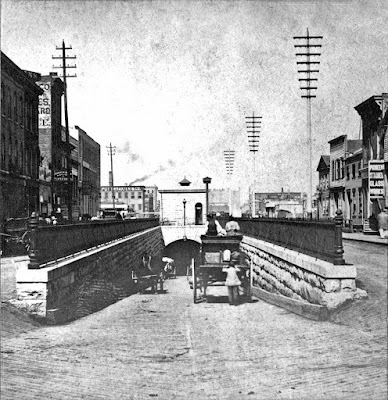 The above photo shows the bridge at Rush Street and gives a clear idea of the impediments that the river bridges' center piers created. 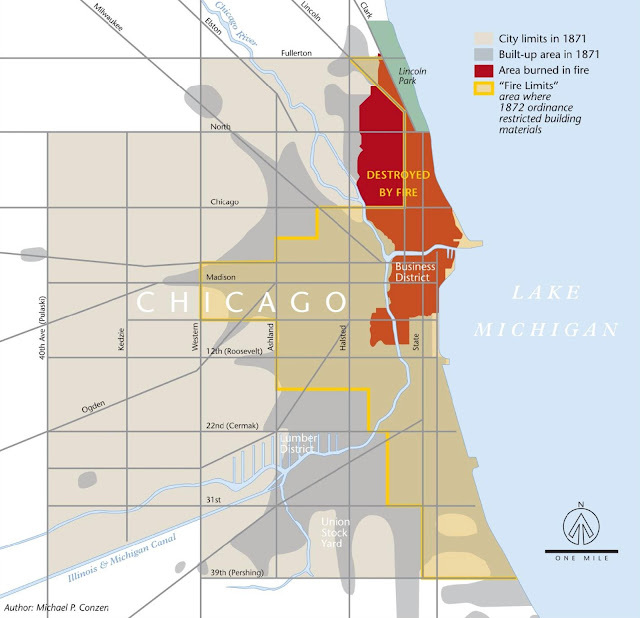 January 29, 1872 – The Chicago Common Council takes up Section 7 of the proposed Fire Ordinance, which reads: “No wood building or part of building within said city limits shall be raised, enlarged, or repaired, except as herein provided: nor shall any such building, or part of building, be removed from one lot or place to another within the said limits of said city; nor shall any such building be removed from without the city limits to any place within said city; nor shall any wooden building within the limits of said city, which may be damaged less than 50 per cent of its value, be so repaired as to be raised higher than the highest point left standing after such damage shall have occurred, nor so as to occupy a greater space than before the injury thereto.” This is a strict covenant that attempts to make sure that the disastrous fire of three months earlier does not occur again. But the council members go straight to work on amending the strictness out of the bill. One amendment substitutes “fire limits” for “city limits.” Another amendment proposes that the Board of Public Works may grant permits to move any building from one place to another as long as the move occurs outside the fire limits. An alderman moves to amend the article with the phrase “provided it shall not be moved on to an improved street.” An Alderman Gardner “thought the Council might just as well pass no ordinance at all as to pass that amendment. It defeated the protection of the city, and was its death-knell.” [Chicago Daily Tribune, January 30, 1872] Another amendment is offered, proposing that “Any person wishing to remove a wooden building, for the purpose of building brick or stone on the same lot, will be allowed to move further away from the centre of the city; also, any person owning a house on a leased lot shall have the same privilege.” Ultimately, the amendment that carries the night is offered by Alderman Gill. It considerably weakens the original wording of Section 7, following the words “from one lot or other in the said limits of said city,” in the original with this addition, “except it be removed in a certain direction, to-wit, from the centre of the city toward the city limits.” That amendment is approved, and the meeting immediately adjourns. As the city begins to rebuild, the struggle to save the ruined city from itself moves forward. The above diagram shows that the final ordinance did do much to diminish the prominence of wooden buildings, but it also clearly shows that huge sections of the city are left out of the mandate. January 29, 1911 -- A new tunnel is opened that carries Washington Boulevard under the Chicago River, the second tunnel at this location. The first one was opened in 1869, but an act of congress in 1904 declared it an "unreasonable obstruction to free navigation," and the Secretary of War ordered its removal. 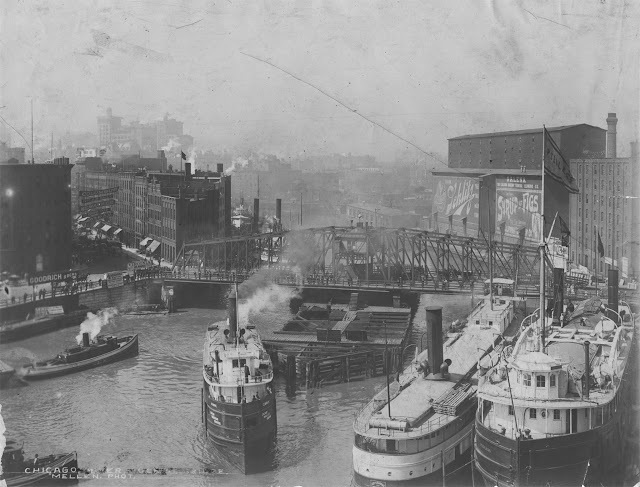 Because the roof of the old tunnel was less than 17 feet below the surface of the river, vessels were constantly grounding themselves on it, obstructing river traffic in a narrow channel that was filled with ships heading to the lumber yards and grain silos to the south. When the river was reversed in 1900, the river had even less depth which prompted the action of congress four years later. The new tunnel lay 27 feet below the surface and extended for 1,520 feet. The tunnel was still used by streetcars in the early 1950's, but the portals were filled in during the 1960's and a tunnel at Washington Street ceased to exist after close to a hundred years of service.